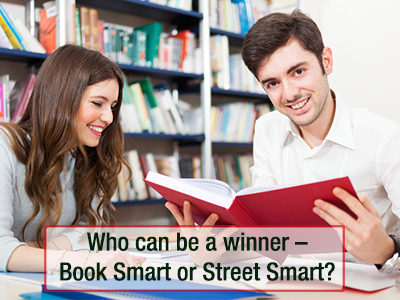 Who can be a winner - Book Smart or Street Smart? Read GD Topic: Who can be a winner – Book Smart or Street Smart? Only someone who is both book smart and street smart can be a winner. A book smart person is someone who knows his facts well. Facts are important for decision making – only after you understand the facts and theories can you apply them to real-life situations. However, being book smart alone is not sufficient for success. An individual should have common sense and understand what is happening in the world - he should not apply the facts and theories to real-life situations blindly –he should use the knowledge in textbooks selectively to make sense of the world. Steve Jobs, the co-founder of Apple, is considered one of the most successful businessmen in history, but he did not have a college degree. Likewise, Michael Dell, founder of Dell Computer, and Bill Gates, founder of Microsoft, gained success without a college degree in hand. Just because these businessmen do not have college degrees does not mean that they are not book smart. They are intelligent in their own ways and did a lot of reading outside of the college arena. For example, Bill Gates scored 1590 out of 1600 on the SAT and even got admitted to Harvard College. This goes to show that he was book smart; it is just that he did not have a paper qualification. So, we can safely say that paper qualifications do not determine if a person is book smart. A person who is book smart is someone who is an expert in his/her field and this is determined through the knowledge he has gained over the years. All the aforementioned businessmen had foresight, which is extremely important in the business world – they knew what the world required and with their prior knowledge, they came up with the right products to meet the needs of the population. What is the use of having all the knowledge in the world if one is unable to apply it to real-life scenarios and solve the problems in the world? A person who is book smart is intelligent, no doubt, but can he translate the knowledge in his brain into effective solutions for humanity? The probability is low. Similarly, a person who has no knowledge but is street smart cannot survive in the world because he has no foundation or skills to depend on. The world does not choose a winner based on the IQ score of an individual or how much knowledge he/she possesses in his/her brain. And neither is one considered a winner if he has practical knowledge but no clue of theories and facts pertinent to a specific field. A winner is someone who has the ability to put the knowledge that he has gained through reading books into practice and enhance the lives of people around him. We consider Mahatma Gandhi, Narayana Murthy, and Barack Obama winners because they have the right amount of knowledge and practical skills. In conclusion, a person has to be both book smart and street smart before he can be declared a winner.